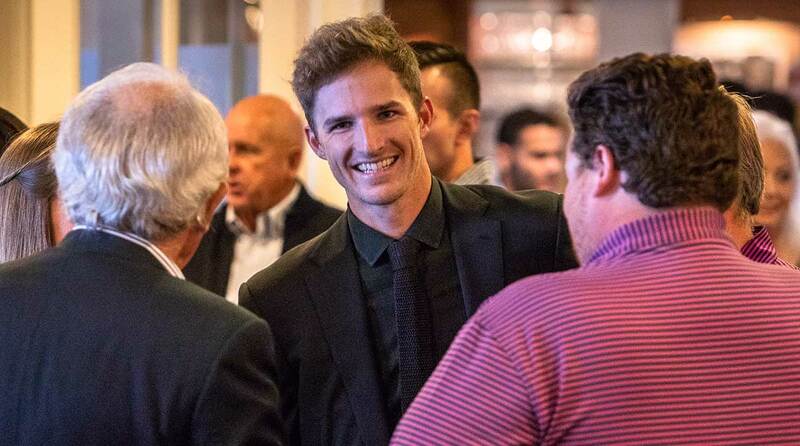 PARAMUS, N.J.—With the Manhattan skyline over his right shoulder shortly before dusk on a perfect late-summer Sunday evening, Morgan Hoffmann finally steps to the microphone, fulfilling a moment he’s been thinking about for months. The crowd gathered at Arcola Country Club is hushed, and no words pierce the quiet. First, Hoffmann pauses just to soak in this scene. His modest vision to start his own foundation and stage a pro-am to raise money to fight the invasive disease inside of him – facioscapulohumeral muscular dystrophy – has come off the canvas inside his mind and sprung to life. For Hoffmann, dressed nattily all in black, like Johnny Cash, and still thin having just returned from a 90-day holistic treatment program in Nepal, this is an emotional, and very joyful, moment. The people jammed together beneath a majestic white tent behind the clubhouse are members, mentors, high school and college pals, and family. The ground under the tent is where Arcola’s old putting green used to be, where young Morgan ran around with a golf club in his hands when he still was in diapers. The crowd, some 600 strong, has turned up for a singular reason–to support one of their own. Hoffmann, who turned 29 this month, looks out to the faces and recognizes nearly all of them. He is humbled. “This means more to me than anything in the world,” he said. “This is my dream.” And it kind of is. And it kind of isn’t. Yes, many athletes use their platform to help others less fortunate, but Hoffmann, a sixth-year PGA Tour professional and former No. 1 amateur in the world, never signed up to do it this way. Nobody is internally wired to face a day when, following five years of frustration, medical mysteriousness and being misdiagnosed trying to find out why his pectoral muscles were beginning to deteriorate, a doctor finally phones from New York to deliver this life-changing sledgehammer: You have muscular dystrophy. “I know people think that’s absurd, because in the United States, everybody says that muscular dystrophy is not curable,” Hoffmann said. “I don’t believe that. I know that it can be cured. I’ve seen a lot of crazy things happen." 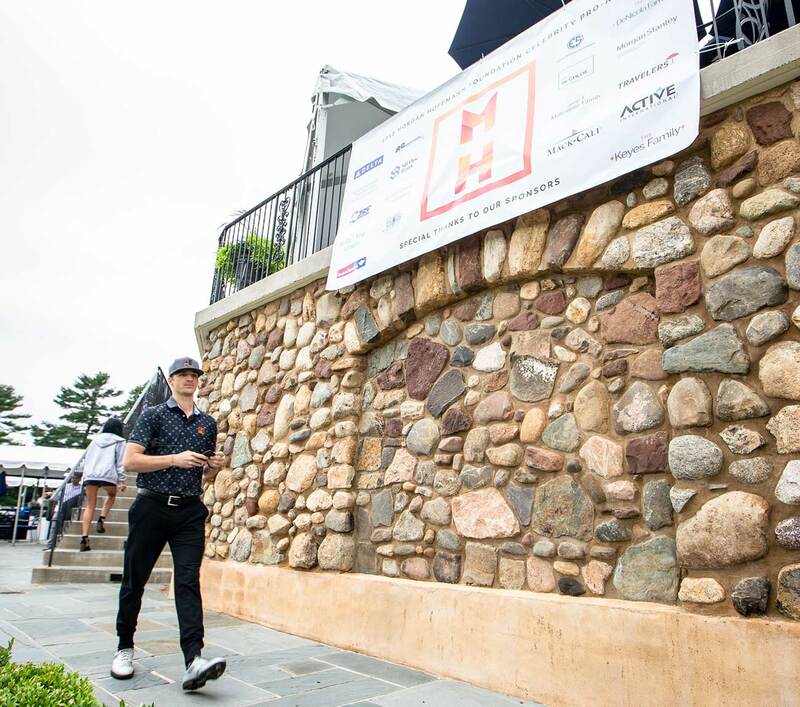 Hoffmann’s two-day event at Arcola included two full waves of a golf outing, live and silent auctions, and concerts by Jake Owen and Jackson Breit. It raised $1.5 million, a wildly successful start, with Arcola donating its venue and staff and a small army of volunteers helping out. The future appears bright, too. More than 50 groups wanting to participate in the golf outing were turned away. “This is all just getting started, but it’s going to be something very special,” said Sam DaSilva, a friend of Hoffmann’s for 15 years who also caddies for him on Tour. (Hoffmann calls DaSilva a brother.) “When Morgan has something in his mind, he’s full-force behind it. He is doing something that is very unique, a unique cause. It mirrors what he has been through. It’s a personal experience. He wants to do something that he’d have liked to have had while going through what he has been through.” This week’s Northern Trust, the first stop of the PGA Tour's FedEx Cup Playoffs, is taking place at Ridgewood Country Club, just four miles up State Road 17, also in Paramus. Many friends of Hoffmann’s who are competing this week stopped by on Monday to play golf with groups and help out. A bunch of former Oklahoma State players were there, from Charles Howell III to Hoffmann’s former teammates Kevin Tway, Peter Uihlein and Talor Gooch. NFLers Jerome Bettis and Phil Simms were there. There were New Jersey Devils hockey players, and even former NBA center Zydrunas Ilgauskas, all 7 feet, 3 inches of him. Rob O’Neill, the U.S. Navy Seal who fired the bullet that killed Osama Bin Laden, played. Sam Saunders shot 62, an Arcola course record. 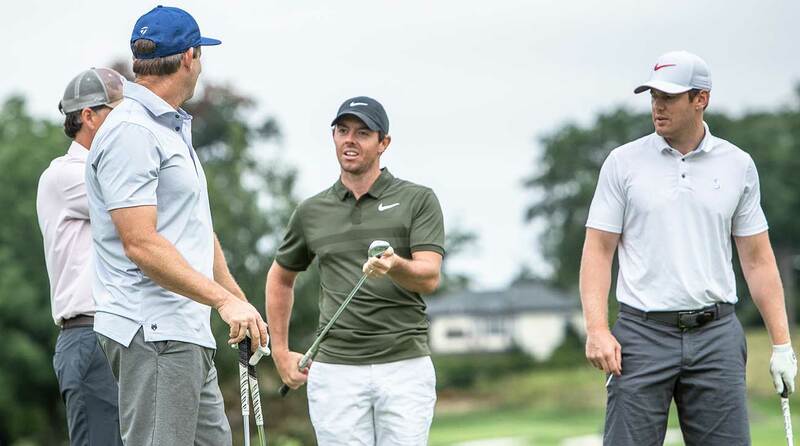 Rory McIlroy has the week off and isn't competing at Ridgewood, but he flew in just to help his Florida neighbor, saying he was touched, as so many were, upon reading the personal story written by Hoffmann in The Players’ Tribune in December. 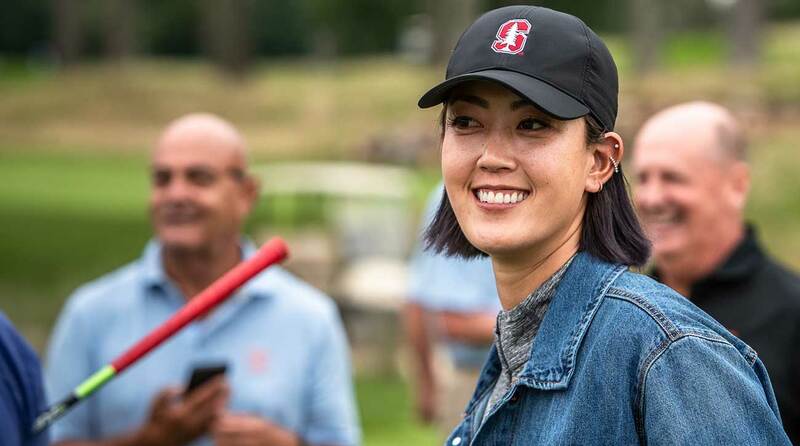 Michelle Wie couldn’t play because of a bad wrist but rode along with a group in a cart. The array of high-priced items being auctioned off beneath the tent speaks to the number of powerful A-listers who want to help. Here was one item: A twosome to golf with Hoffmann and actor Mark Wahlberg at Boston Golf Club, as well as a role in Wahlberg’s upcoming motion picture, “Wonderland.” Oh, boost your bid another $10K, and Wahlberg said he'd throw in an introduction to Boston’s resident GOAT, quarterback Tom Brady. It sold for $40,000. James Hahn started his rookie season on the PGA Tour alongside Hoffmann in 2013, and their lockers usually were in close proximity. He would not have missed a chance to lend a hand to his friend. “It meant a lot to be there,” he said. “To see a guy who had the world at his fingertips to all of a sudden be fighting for his life, and quality of life … I feel like it really could have been any one of us. It really hits close to home.” Rising star Tony Finau will host his own foundation event in Utah in a few weeks. He feels blessed to do what he does for a living, and said he is happy to give back. “Sometimes it’s more about the person than the cause,” Finau said. “We all feel for him. To deal with the physical circumstance that he’s been forced to deal with, we all want him to know that we’re supporting him. It’s humbling to see that Morgan wants to give back. He wants to learn more about the disease that he has. He has inspired me.” In Nepal, Hoffmann underwent 90 days of treatment, enduring two long sessions a day. He’d start at 7:30 in the morning, stripping down to his underwear as assistants would cover his body with herbs mixed with water. He’d wait 20 minutes for the herbs to dry, then turn over and get the same treatment on his back side. The herbs would burn, telling him his body was being detoxified. Afterward, there was a coarse, oily paste applied to him that he’d wear throughout his day. Hoffmann said his time alone in a faraway land helped him to discover a lot about himself. He went through seven days of meditation training, one day meditating for 12 hours. “It taught me a lot about who I really am,” he said. In all, he calls his 90 days in Nepal an amazing experience. It was at times difficult, but mostly enriching. He lost weight, but feels much better now that he’s back in the gym. He will have six more months of taking herbs orally, and in three months will get his blood tested to see if there’s been any improvement in his condition. “I almost broke a couple of times, but it really made me stronger,” Hoffmann said. “I learned a lot about myself, and what I can handle, and that my mind can really get through whatever I put it through.” Hoffmann realized when he received his diagnosis that self-pity would do nothing to help him. Dealt a tough hand, he has responded by being a beacon of positivity. At Arcola, his radiant attitude helped to give everyone hope about what is ahead. He once chased a Tour card by being incredibly driven, and now he has a much bigger goal to chase. A bigger purpose. The title of his Players’ Tribune piece was “So Damn Lucky.” That’s exactly how he feels as he and his girlfriend, Chelsea Colvard, make their way from circle to circle at Arcola, thanking people, shaking every hand they can. A short time ago, on his Instagram page, Hoffmann posed a question: What is the most important thing in your life right now? His answer: This moment. And this moment at Arcola – two days of beautiful moments, in fact – is something very special to him. It will only fuel Morgan Hoffmann to do more. MD, you'd better watch out.